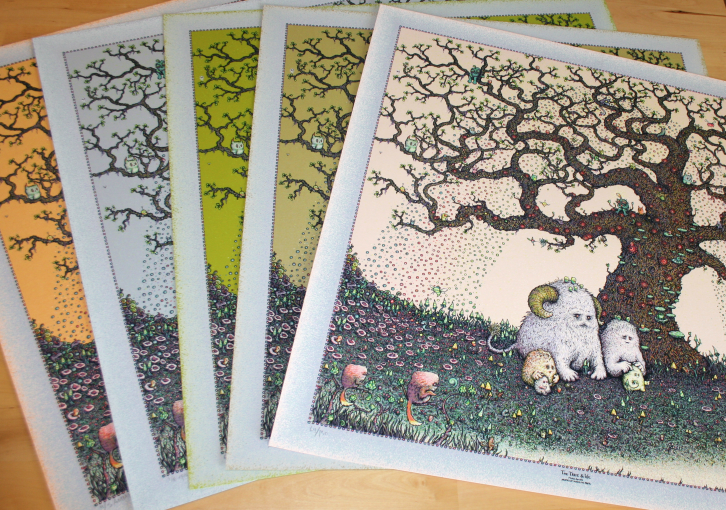 A small stack of The Tree & We prints being sold, lottery style. We were very happy to recently discover a box of the long sold-out, often requested Tree & We prints. 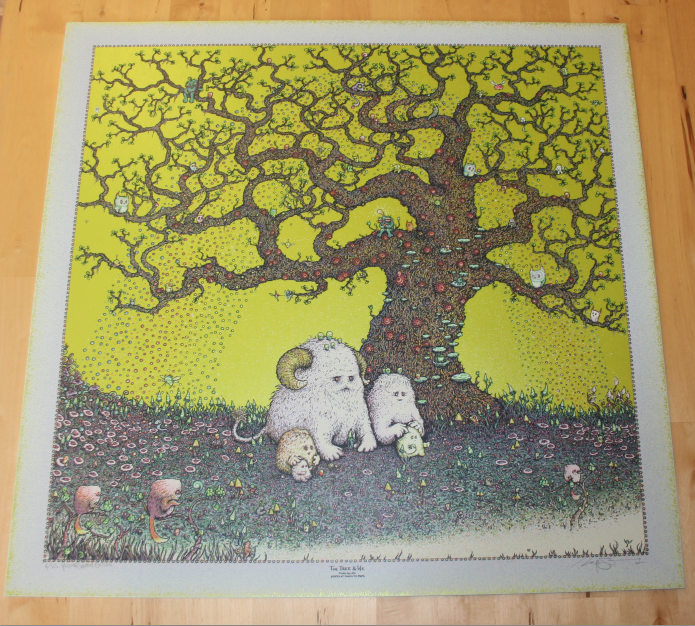 This seven color screen print from 2012, is one of Marq’s biggest to date at 23″ x 23″ and contains too many critters to count. The artwork also experienced a rebirth in 2014 when it became the cover for the new J Mascis album, Tied to a Star. There are only twelve copies of the print that we are able to offer up to you folks here, in the format of a purchasing lottery. We expect the demand to be rather high for these, and we all wish there were more to go around. Most of the editions were sold years ago. In other words…don’t get your hopes up too much in this lottery. There are 5 versions of this print, and we have at least 1 of each available. You can view each edition in the photo gallery above. Main Edition of 150 (6 available) = $150 + shipping. Chlorophyll Edition of 25 (2 available) = $245 + shipping. Yellow Green Edition of 25 (2 available) = $245 + shipping. Opal Edition of 6 (1 available) = $300 + shipping. Amber Edition of 5 (1 available) = $300 + shipping. • Interested customers may enter the purchasing lottery only once by posting a comment with their choice of which ONE of the five versions of the print they’re most interested in purchasing. • Customers will be selected randomly, and invoices will be sent through Paypal. • Invoices will start going out shortly after this post goes live, and throughout our West Coast evening. • Things that will increase your odds of not being selected as a customer would be: Commenting more than once, picking more than one choice, or no choices at all. Using aliases is also highly annoying and we’ve banned a handful for trying it. I’d love to enter for the chance to purchase the regular edition please and so many thanks!! I am interested in the main edition! Thanks!!! I have always dreamed of having the Amber Tree & We print! I certainly appreciate this chance to own one! Opal Edition Please and Thank you for the Chance!!!!! Would like the main one. Thank you! Main edition please! Love train! Thank you! Opal edition would be so awesome. Would love a chance at the yellow green edition!! Thanks a ton! Much love to Marq and the gnomes !!! I’d love a shot at Yellow/Green. Main edition please and thanks! Yellow Green please!!! Thank you for the opportunity! Cheers! Chlorophyll Edition please! good luck everyone! I’d love the Main edition. Thanks for the chance! I’d love the main edition. This is gonna look awesome in the NEW nursery!!!!! Main Edition. Thx for the chance! Main Edition please sirs and madams and gnomes. I would like a chance at the main edition. It reminds me of my three young nephews on summer days just hanging out. Best company to have ever ! Please please please an amber edition for me!!! It’s my birthday and this would be a freaking awesome gift to myself!!!! Of course my husband will be paying for it!! Hahah thanks marq and the gnomes! Wowzers what a lotto! Please consider me for the Chlorophyll Tree – Thank you! Chlorophyll Edition pretty pretty please!! i am interested in the opal edition please!! Amber Edition please and thank you ! I would love a Chlorophyll Edition please!!!! Thank you Marq and Friends! Amber edition, please and thank you!!! Main edition please and thank you! Main edition please! Thanks Marq and gnomes!! Main Edition! Thanks for the chance! main edition please!!!!!!! love your work!!! Amber would do just fine. Thanks!! And thank you for a great opportunity! Amber… please n thank you! Chlorophyll Edition would be fantastic – pleas and thank you! I would love the OPAL so much, thanks for the chance. Good luck everyone. Brand new collector! Would love a opal edition! This print is beautiful! Thanks!! i would like the opal edition please. Would love our 1st Spusta print to be an Opal. Thanks! I would like a main edition please! Yellow Green please! Love the contrast! I’d love a shot at the Opal please and thank you. I would love the Opal edition please. One of my all time favorite prints! Just beautiful. Main edition please. Thank you! Thank you for the opportunity Marq. Main edition. Thanks for the chance! I am in for a chlorophyll edition please! Main Edition Please and Thanks!!! Have a baby on the way and this image is perfect for the baby’s room. Thanks marq! C55H72O5N4Mg =Chlorophyll …for me please. allows plants to absorb energy from light as I absorb energy from this print. Thanks Marq! Yellow & Green. Please and Thank you! Main edition for me, thanks! Would appreciate the chance to purchase an Opal variant. YG Please! Thank you for the chance Marq. My fav print! I’d love a main edition. Thanks! in for a chlorophyll please! Would love the main edition. Thanks foe the opportunity an the art. The girls and I would be GRATEFUL for any Tree & WE. Amber is the favorite, but any would be a treasure. I’m you Main guy ! I would love a chance to own the yellow & green Tree & We please! Main Edition please! You’re the best! Amber please, looks incredible. Happy New Year! Amber please! Thank you kindly! Thank you for the wonderful opportunity! Gnomes rock! thanks so much for offering these up. Would love love love to purchase the regular main edition pleas and thanks!!! Id love to guve a good home to a Chlorophyll! any color would be fine, by the way! Been looking for this one. I would love to purchAse a copy of the yellow/green edition. Thanks for the consideration! I would absolutely love the AMBER edition. Thanks so much! Hoping to end my Spusta drought with a Main Edition please! Thanks! Would love any!! But lets go for a chance for a main edition! Thanks even for the chance Gnomes!! Please consider me for the main edition of this awesome print. Thank you very much. Wow! I would so very much appreciate an original edition. Pleeeeease! Good luck everyone! What a treat!!! Thank you for the chance as always!!! Feeling super ballsy right now. I would like to try for a main edition please. My new nursery would be perfect for it! Never hit a lotto – Hope I break that luck with my favorite art print! I just want one. Any flavor will satisfy my soul. Well my favorite is the Amber so that is what I would like to be in the lottery for. Can’t win unless you play!!! Good luck everyone, may all of your Spusta dreams come true! Go big or go home! I’d like a shot at the Amber please. Main edition, please and thanks! I would be interested in the Main Edition please ! Would love a Main edition Tree and We thanks for the chance! Opal! Thanks for the chance! Yoohooo ! Yellow green edition sounds good ! I would love one of the Main Editions of the Tree and We, please!! Thanks so much for letting us play and giving everyone a chance! I would like the chance to own this piece. Main piece please and thank you! Trying the lottery for the Chlorophyll Edition please. Yellow green please!!! Pretty pretty please! Thank you gnomes and Marq!!! Chlorophyl please!! Beautiful piece of illustration, sir. Top notch!! wpuld love to own the Amber! What a beautiful image! I am interested in the Yellow-Green edition. Main Edition will be great as I have NONE! Yellow Green please!!! thanks for the chance, Marq! I would love a chlorophyll edition! Many thanks!!! I would to get one of these for my girlfriend for Valentine’s day. Yellow green please and thank you!! I am most interested in purchasing one of the Main editions. First timer here! Thanks! I will hope for the yellow-green edition! We would love a yellow green for baby Millie’s room. Thanks so much for the chance!!! Forget the powerball, this is the real lottery!!!! Chlorophyll would be my choice. Thanks for digging these out! Yellow Green Please. Thank you Marq. I would be very grateful for a yellow/green version! Thanks for the opportunity! Would be a great start to my February if I were picked for one of those main editions! I would LOVE to a main edition please!! I’m in it for the main edition! Let me frame this and put it on the walls for the world to see!! Regular version please and thank you for these! Going for a yellow green edition. I would love an invoice for a regular edition pretty please! Wow, amazing! Got my eye on that opal…..
Main eddition please and thank you!! I would be super stoked with an opportunity to purchase a Main Edition..Cheers! I would love to have a chlorophyll edition for my collection! Thanks for all your amazing artwork! Would love the Yellow Green edition! finger in the air looking for that miracle! Would love to have a Main Edition! That would look greatin my daughter ‘s room surrounded by her smaller Spusta prints! Thanks for the chance! own one of these beautiful pieces! Ohhh the main edition, please ! Would Love a chance to grab a “Main edition” Thanks for giving us a shot at these beautiful works of art!! OMG I would love a print from the main edition. Thank you so much! I would love a print from the Main Edition. Thanks for the opportunity. My wife wants this one more than anything for our little girls room! Thanks for this incredible opportunity! I would to get an Ambrr edition of this print!! This would make me forget about all the snow outside my window!! fingers crossed for a shot at the yellow green. Thanks for a shot at another awesome Lottery! So awesome! Please put me in the raffle for the opportunity to buy a regular edition. We love this print marq! Thanks for doing these lotteries! I would love a chance at the Main Edition! Main edition was be fantastic! Thanks for the opportunity. Yellow/green please, hopefully luck is on my side today. Thanks for the chance Marq! Amber please and thank you! A main edition would be awesome. Would love a main edition . Thanks for the shot. Yellow green edition pretty please! That opal would look incredible in the nursery. I promise I’ll keep it forever!!! opal would be my choice. What an opportunity, thanks ya’ll! Wow! What a hard choice! I think I would like the Main Edition, if I’m lucky enough! Hoping for a main ! Thanks Marq and the Gnomes. I’d love the main, regular edition. Main edition please and thank you!! Green & Yellow!! Please & thank you!! A main edition would look lovely hanging here in Scotland. Opal edition please, thank you for the opportunity. Opal please 🙂 thanks ! I’d love a shot at the main edition please! I’d love to add an opal edition to my Marq’d wall. Appreciate the chance!!! I’d like to get an Opal version for my first Spusta art print. Yellow Green for me please. Thank you Marq for the art you create! Amber edition would be my choice! Thank you! Main edition for the win!!! Main edition. One time dealer!!!!!!!!!!!!!! Oh Baby! Daddy likes Amber! Main edition, please and thank you!! What a lottery! Put me in for the Chlorophyll please! Main Edition please & Thanks. The opportunity to purchase the main edition would be appreciated. Good luck everyone! Main edition please!!! They are all so beautiful, thanks for the chance!! I would love the amber edition! Main Edition, please! Thank You!!!!!!!!!!!!!!! AMBER is the color of your energy!! Main Edition please. Thanks for another piece of beauty! Yellow Green please! Thank you for doing this as always! Would love to hang the main edition in our home. Thanks again for the opp! Would love a main edition PLEASE!! My #1 ISO. Thank you Marq and gnomes!! Could really use a ray of sunshine!! Would love that AMBER!!! Thank you! Would absolutely love an Opal edition! Thanks for the opportunity! I prefer the Yellow Green edition. Main Edition. Keep up the spectacular work! Opal, please. Based in Canada. I’d love any but would prefer opal. Thanks! I would love one of the main ones. It would fill a hole in my wall nicely. Thank you so much for the opportunity to FINALLY find one of these beauties. main edition please! I’ve been searching for this! I would live a main edition. Thanks so much!!! Main please!¡! From my ol school bones to your young ears, please please please make my day brighter and ooey gooey!! Love to you Marq and the gnomes~~~forever and always! Main edition would look ace in my front room and I can afford it! Hey Marq! Thanks so much for a chance at one of the finest pieces to come out of 2012. This one has so much fun stuff going on! I would love a chance at the Amber variant to join my walls. Good luck to all and be kind to your mothers! I would like a chance at the main edition please! Chlorophyll Edition for me please! Thanks, as always, for the opportunity! Yellow green for me, please!!! Te main edition is fine by me. thank you. I would love an amber edition biggest ISO i have ever had. Regular edition would be great! Your awesome! Chlorophyll Edition of 25. Please and Thank You for the chance! I like this 1 Jimmy! Amber variant please & thank you. Regular edition if I’m not to late!!!! Main Edition please! ahh so excited I just cant hide it! Yellow green please and thank you. So awesome! Yellow green edition!! Please & thank you!! Main Edition of 150 please, thank you Marq!!! My favorite print! I would lovingly frame the Amber and give it a prime spot on my wall! yellow green edition would make my decade.. No wait.. Century!!!! Thanks for the opportunity to add this to the wall! Opal is my favorite ever. Would love the main edition!! The main edition looks amazing! I’ve always loved Dinosaur Jr. and I’m so glad J. Mascis is still recording! Opal edition please and thank you! I would absolutely love one of the Main Editions. Thanks for the opportunity. Aw, love the little Tree & We family… an entry for the main edition, please. Please enter me to buy a Regular Tree & We. Would love to own a main edition of this! But would take any!!! Amber please and thank you!! Main edition – would be my first choice. A Main Edition would please me! Main edition please! Thank you!! Main Edition por favor y gracias! I am interested in the main addition! Thanks! I’d love a shot at the Opal edition, thanks for the opportunity! Main edition to the UK please Marq. Thanks. Hope it’s not too late! I’d love the yellow green, please! Thank you! Probably too late, but main edition please. My walls need to be photosynthesized! Regular edition for me. Thanks for the opportunity! Thanks for the chance Marq and the Gnomes!!! Main Edition of 150 Please! Yellow Green Tree for Me!!! I would LOVE a Main Edition! Yellow green is my choice…. I am blown away at this opportunity. We play J mascis several shades of why almost every night and collect j and de junior vinyl. Also waited patiently after J’s chicago show here in chicago recently to get my vinyl signed. Did not happen but i did get his pick…what an awesome Spusta pic! I would honestly love to have one of these special prints to frame in my daughters room with the guitar pick. 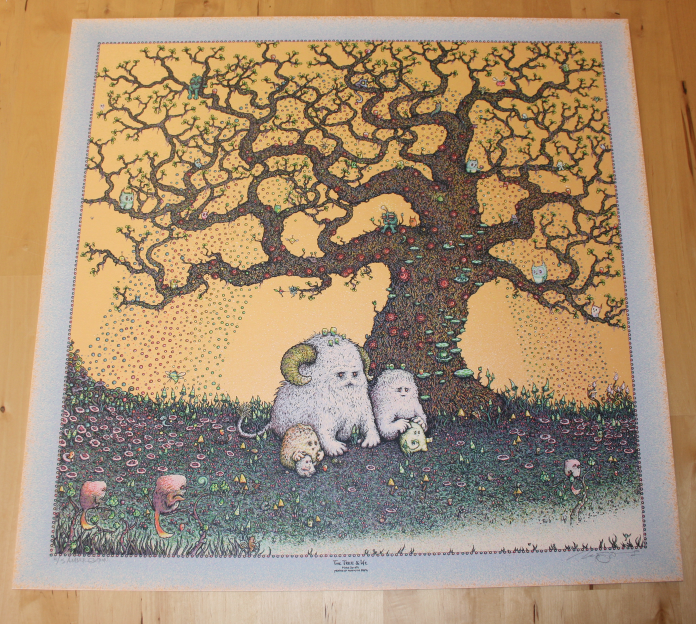 Regardless if I win this lottery, I just wanted to share my love for J Mascis and how much I love that you ( m Spusta) do his art! It’s special…..
Main of 150, please ! Very happy with a Main edition! The main print please and thank you. I would love a shot at one of the regular editions. So beautiful. Main edition please. Thanks so much for the opportunity, good luck to everyone! Main Edition, please. Thank you! I would love the main edition! Thank you! I’m sure I’m way too late, but if there’s a chance I’d love a shot at the amber edition. I would love to be able to purchase a main edition of this print. Thanks! That amber is calling my name! Wow, thank you for the opportunity. I’ll go for a yellow-green if I’m not too late! I’d love the main edition, thanks! marq, please put me down for amber edition. the best looking one imo is the Amber edition. Main Edition. Plz & Thanks. I’d love the Yellow Green!! I’d love the main edition but will take anything! I’d love a Main Edition print! You’re work is amazing!!! I would like a shot at a Chlorophyll Edition, please. Thanks! Main one, main one !!! Amber variant would be fantastic. Thank you! Main Edition – thanks for the opportunity. Yellow Green Edition – Thx!! i got Spusta fever, I think this might help. I would love a main edition please and thank you! Yellow Green edition is my preferred choice if chosen. Thank-you! No idea if all of these are gone, but I’d be thrilled to have any of them to grace my wall. If I had a choice, I’d want the Amber Edition. 3) I LOVE your work. (published herein again because I’ve mistyped my e-mail in the last comment, sorry).